New rust removal product introduced by My Cleaning Products. The company asserted that it is both effective and safe. And so, for a safer rust removal process, My Cleaning Products suggested the use of an organic-based corrosion solution instead. Rust removers offer a way to save corrosion-damaged items fast and easy. However, not all of them work effectively and safely. 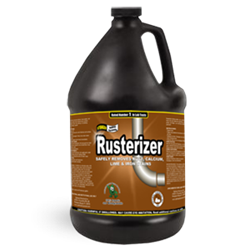 And so, to provide the public with one that could clear rust without putting anyone's health at risk, My Cleaning Products introduced its organic rust removal spray called Rusterizer. Corrosion or rust is particularly common on metal items. It eats them away until there's no more moisture in the air or anywhere else and iron in the items to support its process. Because of that, it's causing a huge sum of money either for the repair or replacement of the damaged pieces. But rust could be prevented said My Cleaning Products. It stated that if a place is kept dry, its formation and spread are blocked. Hence, one could also be spared from its structural, industrial and financial damages, it cited. Nonetheless, there are sources of moisture everywhere. Besides that, many of them aren't easily noticed. For that reason, My Cleaning Products said that it's best for everyone to have a rust remover prepared. That way, it asserted, one could clear rust right away. And that, it added, prevents its further spread and any unnecessary expense. But MCP warned the public not to get just any rust remover. It elaborated most of it in the market are made of harsh chemical ingredients that could do more damage than help. Particularly, it pointed out that they could pose risks to health, as difficulty in breathing and coughing, and further pollute the environment. And so, for a safer rust removal process, My Cleaning Products suggested the use of an organic-based corrosion solution instead. Specifically, it advised the use of its Rusterizer. Being organic, the company explained that Rusterizer leaves no harmful residues whenever sprayed. Because of that, it stated that it is definitely safer for anyone's health and even the environment. Moreover, it cited that it was already proven to be effective by many rust victims. In fact, it added that anyone else could prove it himself that it is truly effective and safe for a rust removal process anywhere. And as it stated that's because there are Rusterizer Complimentary Samples everyone could request and test at MyCleaningProducts.com.